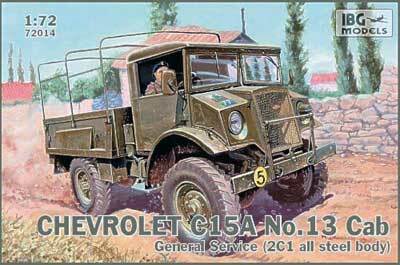 Chevrolet C15A No. 13 Cab General Service. Chevy-built Canadian Military Pattern 15 hundredweight (3/4 ton) 4x4 truck with type 13 cab incorporating downward angled windshield – GS configuration. Kit features detailed chassis with full engine/powertrain and suspension. Also includes cab with interior, acetate windshield panes, and detailed bed (2C1 type all steel texture) with body cover frames. Decals and painting reference for 2 vehicles: 2nd Canadian Infantry Division, Normandy 1944 and “Old Bill” of the 1st Canadian Infantry Division.